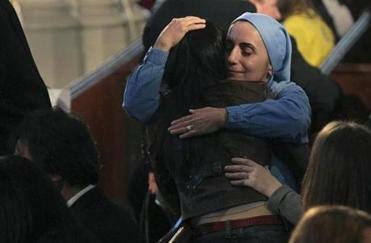 About 2,000 people packed the Cathedral of the Holy Cross in Boston to unite with clergy and political leaders and remember the victim’s of Monday’s bombings. President Obama visited a city in mourning Thursday, casting himself as an old friend as he promised that the perpetrators of the Marathon bombings would be brought to justice and that the community’s resilience would carry it forward. Addressing more than 2,000 people, including many who witnessed the bombings, and millions more watching from work and home, Obama spoke with affection about his ties to Boston during an emotional interfaith service. Invoking the grit of marathoners, he told a rattled city that, in the aftermath of the attack, commitment to a free and open society would triumph over fear. 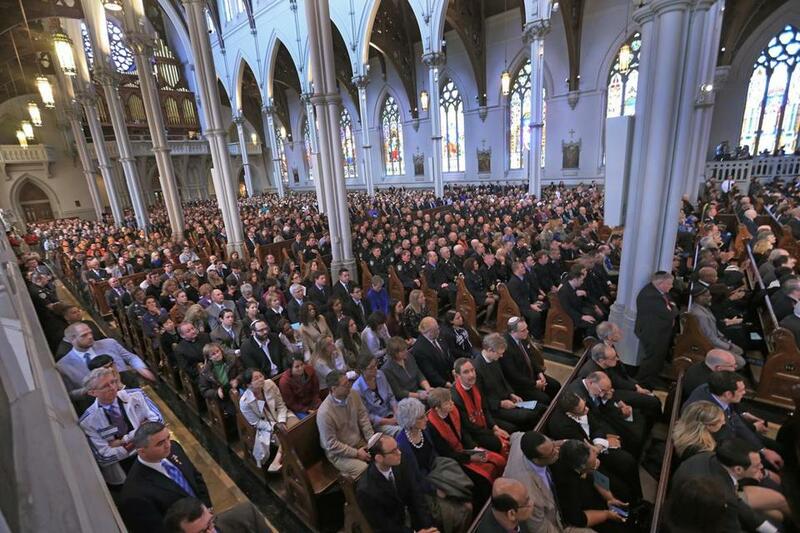 The service, held at the Cathedral of the Holy Cross in the South End, included reflections from clergy of different faiths and from Mayor Thomas M. Menino and Governor Deval Patrick. The Boston Children’s Chorus and the cathedral’s concert choir sang, and Yo-Yo Ma gave a haunting performance of the Sarabande from Bach’s Fifth Suite for Cello. Many of the attendees said the service provided both solace and solidarity and left them inspired. As the sanctuary fell silent, and the first strains of “Amazing Grace” rose from the cathedral choir, there was a sense the whole town was there, in person or in spirit. The pews held doctors in scrubs, runners and race volunteers in marathon jackets, and politicians in suits, including four former governors. There were soldiers in camouflage fatigues, emergency medical technicians in khaki uniforms, and police in blue. The family of bombing victim Krystle Campbell came, as did a young man with crutches who had been injured in the blasts. Two X-ray technologists in blue hospital scrubs found themselves seated next to Ma in the second row. They had been working when the bombs exploded and casualties flooded the hospital. They were back at work Thursday when they were dispatched to the interfaith service. The Rev. Liz Walker, of Roxbury Presbyterian Church, opened the service with a question that she said confronted — and confounded — people of many faiths. The ailing mayor, discharged just hours earlier from Brigham and Women’s Hospital, where he was recovering from surgery, seemed to physically embody the pain and resolve in the air. He arrived in a wheelchair. With a terrible grimace, he pushed himself to his feet to speak. He said his love for the city and its people had never been stronger. Outside, the sun shone and a cool wind blew. Thousands gathered on Washington Street in a queue that stretched for blocks. Security was tight; the streets surrounding the cathedral were blocked off, bomb-sniffing dogs patrolled the streets; bags and water bottles were not allowed inside. Among those waiting was Lorri Miner, 54, of Quincy. Her hands shook as she clung to a US flag, and tears ran down her face. She said she was a recent widow and coming to the cathedral was the only thing she felt she could do to help the victims of the bombings. Matthew Van, a tall Boston University graduate student, arrived alone in a shirt and tie. The clergy who spoke offered somber reflections on tragedy, the presence of God amid suffering, and the power of taking care of each other. The governor gave thanks for the selflessness and resolve on display in the aftermath of the explosions, pointing to the surgeon who finished the Marathon and kept on running, straight to his operating room. “Massachusetts invented America!” he said, to applause, calling the bombing an attack on America’s civic values of equality, opportunity, freedom, fair play. Obama said that, like many Americans drawn here by the city’s colleges and universities, cultural institutions or the Boston Marathon, he had “a piece of Boston in me.” He and Michelle Obama attended Harvard Law School, and at the 2004 Democratic National Convention here, he made the breakthrough speech that put him in the national spotlight. He painted a vivid picture of the city on Monday — sun glinting off the State House dome, signs of spring in the Public Garden, people jumping onto the T to see the Sox at Fenway. The president addressed the wounded, including those who lost legs in the explosions, suggesting that some may be watching from hospital beds. As people streamed out of the dim nave into the bright sunshine, Linda Denekamp, a nurse at Beth Israel Deaconess Medical Center, said she found the service uplifting. “It was inspiring — one of the most moving things I’ve heard,” Denekamp said. Francisca Benedict, of Jamaica Plain, said she was struck by the hopeful tone. Two runners in their 50s from suburban San Francisco, Karen Richards and Cheryl Babel, wore their yellow and blue Marathon jackets to the cathedral. On Monday, Richards felt the shudder of the blast and saw the plume of smoke as she crossed the finish line. Babel had to stop a half-mile short when she heard what she thought was thunder, or a celebratory cannon. Both had run the Marathon before and through the race had developed a kinship with the city that brought them to the cathedral Thursday. Wesley Lowery, Martine Powers, and Andrew Ryan of the Globe staff contributed to this report. Lisa Wangsness can be reached at lwangsness @globe.com.